← Photo of the week: Cupcakes! My Grandma Betty was a quilter. Her quilts weren’t fancy – no Triple Irish Chains or Wedding Rings – but they were cheerful and pretty, and they did their jobs. You know, a quilt has several jobs: sure, it keeps us warm. But that’s not all it does; it also decorates a bed beautifully, and it uses up leftover fabric scraps from other projects. A thrifty woman like Grandma Betty, who lived through the Great Depression and hated waste, would craft even the smallest bits of fabric into a Crazy Quilt that was bound to make you smile. When my grandma died a few years ago, I inherited two of her quilts – adding to the one she made just for me, with “For Linnea From Grandma” stitched into the corner – and several of her braided rugs, too. They keep my home warm and cozy in winter, they add to its beauty and, maybe most importantly, they help me remember my grandma. She’s in my thoughts often as her creations grace my home. Not everybody is lucky enough to have a grandma who quilts, and we don’t all have these handmade remembrances of loved ones who have passed. But that doesn’t mean everybody can’t beautify their home with a warm and practical memento of a loved one. A bereavement quilt can help you preserve memories just as my grandma’s handmade quilts do. 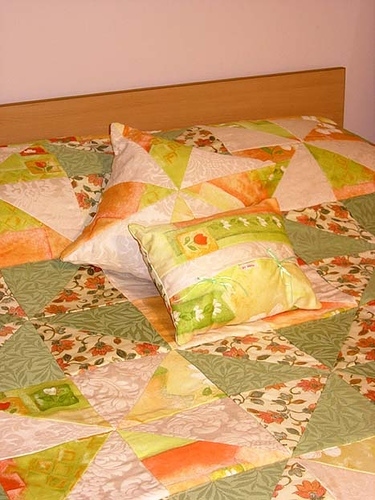 A bereavement quilt is made from your loved one’s clothing, crafted into a one-of-a-kind coverlet. Many companies and individuals make them, and most can use all types of clothing in the project – favorite suits or t-shirts, dresses or neckties, and more. The clothing you select will help influence the pattern, giving you a quilt that uniquely reflects your loved one. You can learn more by entering “bereavement quilts” into your search engine, or go directly to pages for quilters like Sentimental Quilts, Rhino Quilts, or Quintessential Quilts. We don’t have a favorite – we’ve seen lovely work on all their sites, as well as all the others we’ve looked at. We recommend you take a look at their work to find the one you think can best help you remember your loved one. Just like my grandma’s quilts, bereavement quilts have many jobs. They add warmth and beauty to your home. They give you something practical and meaningful to do with your loved one’s clothing. And they provide a warm embrace to wrap yourself in and remember someone who meant the world to you. This entry was posted in Life at Legacy.com and tagged Tributes. Bookmark the permalink.